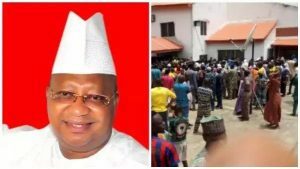 Adeleke’s corpse brought home; returned to hospital for autopsy – Royal Times of Nigeria. Supporters of Senator Isiaka Adeleke and hundreds of residents of Ede are in tears and wailing as the corpse of the politician is brought back to his residence before it was conveyed back to the hospital for autopsy. The corpse was dressed as a living being and brought in seated in a Sienna car. Sympathisers surged towards the entrance of the sitting room as the corpse was brought back into the Sienna car. Sympathisers waiting at the entrance of the mansion surged in and rushed inside to catch a glimpse of their political leader and benefactor. Mourners including the youths and aged ones were seen wailing and rolling on the ground as they rain curses on those who they claimed poisoned him. Some of those who entered into the living room said the corpse was being bathed now in preparation for the burial. Some imams are sighted at the premises which indicated that he might be buried very soon. The remains of Senator Isiaka Adeleke, have been taken to a hospital for autopsy.